Juneberry Lane: Tutorial Tuesday: Homemade Peanut Butter Eggs in 3 SIMPLE Steps!!!! 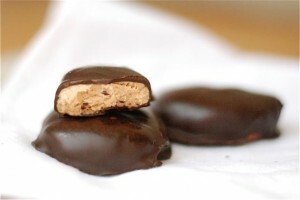 Tutorial Tuesday: Homemade Peanut Butter Eggs in 3 SIMPLE Steps!!!! Easter is almost here, can you believe it? And just in case you have been meaning to whip up something homemade & delicious for your yummy Sunday dinner and are starting to panic because you are running out of time . . . have no fear! These holiday favorites can be whipped up in no time and best yet, in 3 simple steps brought to you via The Family Kitchen! See for yourself . . .
1. In a large bowl mix the peanut butter, butter, vanilla, and salt with a wooden spoon until well combined. Then add the confectioners’ sugar and stir it well until is completely incorporated with the peanut butter mixture. 2. Use your hands to roll the peanut butter into egg-like oval shapes that are 1/4 inch thick and chill them on a plate in the fridge for about 1 hour. 3. In the microwave melt the chocolate chips until they are completely smooth. Remove the peanut butter balls from the fridge and dip each one into the melted chocolate until they are completely coated. 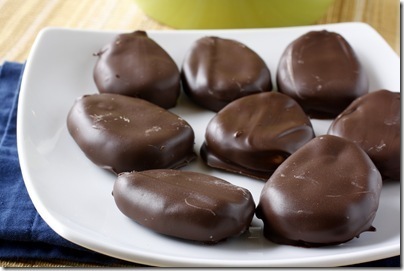 Line a plate with wax paper and allow the chocolate to cool and harden before eating. Just plain perfect, don't you think?